The project focuses on providing the information regarding the pesticide/insecticide and the amount of pesticide/insecticide to be used for an unhealthy crop. 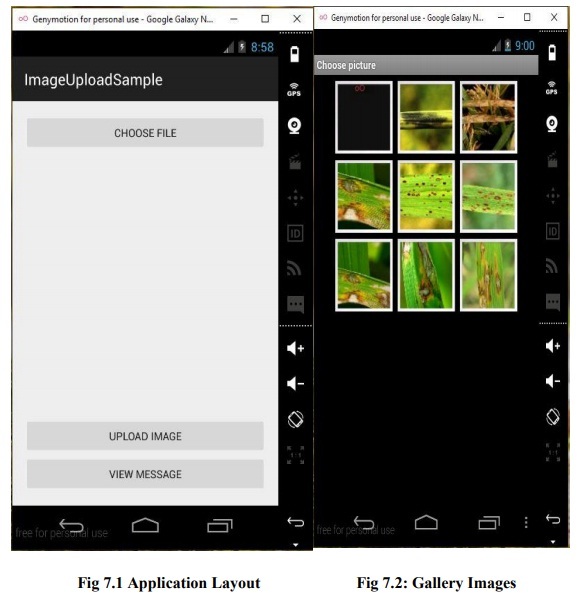 The user, who is the farmer clicks a picture of the crop and uploads it to the server via the android application. After uploading the image the farmer gets an unique ID displayed on his application screen. The farmer has to make note of that ID since that ID has to be used by the farmer later to retrieve the message after a while. The uploaded image is then processed and accordingly the features of that image are extracted. Based on those features the clustering of image is done and the best cluster giving the maximum information regarding the affected part is selected. Then the result consisting of the disease name and the affected area is retrieved. This result is then uploaded into the message table in the server. Now the Farmer will be able to retrieve the complete information in a presentable format by entering the unique ID he had received in the Application. An Image is a two dimensional signal. Image processing is a method to perform some operations on an image, in order to get an enhanced image or to extract some useful information from it. Advent of new technologies such as Digital image processing and Image analysis technology has many applications in the biological field. About 78% of the farmers are small and marginal in the country and they are poor in resources. Therefore, they are not in a position to use optimum quantity of inputs in their crops which are essential for increasing the productivity. Most of farmers may not know the amount of fertilizer required for crops and thus it may lead to unbalanced use of fertilizer and they may also not know which pesticide/insecticide to be used for the diseased crop. Hence the yield gets affected. A user friendly application installed on Android phone may to some extent help farmer solve the problem of a farmer to detect a disease. The farmer clicks the image of the crop and sends it. The image is processed using the Image Processing techniques and the disease is detected. The details of the disease and the area affected along with the amount of pesticide/insecticide are sent to the farmer and the farmer can see the details in his application. This may prove benefits in monitoring large fields of crops, and thus automatically detect the symptoms of diseases as soon as they appear on plant leaves. 1. 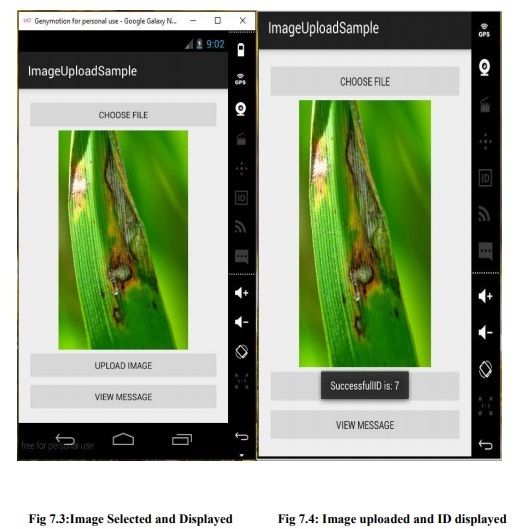 The project aims to obtain an image from the farmer of the diseased crop preferably the stem or the leaves through the Android Application installed on farmer’s phone. 2. The image is then processed using image-processing technique and the disease type is detected. 3. The diseases affected to the crop and the amount of fertilizer or the pesticide/insecticide is identified. 4. The information is updated to the application that was used by the farmer to send image. 5. The farmer can view the message and apply the results to the crop. In the proposed system at first the images are acquired from the farmer. The images are received from the farmer via the Android Application developed exclusively for the service of the farmer. The images are uploaded by the farmer by choosing the appropriate image of the leaf or the stem preferably from the Choose File option. On uploading a image the farmer receives a ID which has to be used later by him to check the pesticides for the affected disease. The image uploaded by the farmer is processed by the MATLAB. Then image-processing techniques are applied to the acquired images to extract useful features that are necessary for further analysis. After that, several analytical techniques are used to classify the images according to the specific problem at hand. The disease type is detected and displayed by the MATLAB. The affected area is also displayed to identify the severity of the disease. The pesticides for the detected disease and the amount to be given to the plant are entered into the database. The farmer in order to see the details has to click another button in the app which is View Message. On entering the ID which was previously displayed to the farmer the farmer can view the details that were uploaded. Automatic detection of plant diseases is an important research topic as it may prove benefits in monitoring large fields of crops, and thus automatically detect the diseases from the symptoms that appear on the plant leaves. This enables machine vision that is to provide image based automatic inspection, process control and robot guidance. Comparatively, visual identification is labor intensive, less accurate and can be done only in small areas. 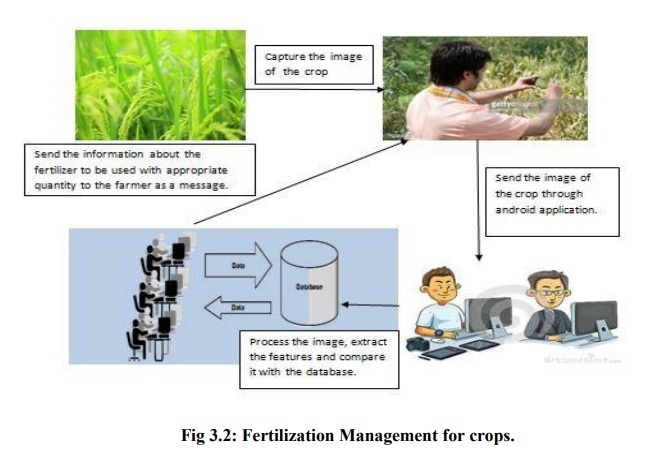 The android application for the farmer was developed using the android studio.The development of the app had various stages such as creation of server, storing images in the database, accessing images from database, updating information into the database and extracting message from the database. The farmer uploads the image using Upload Image button and an ID is displayed to him.The image is acquired from the server. The image can be accessed by MATLAB using the URL of the php file in the server. The GUI of MATLAB has an interface which consists of a button called Image Select. On clicking Image Select the image directly gets downloaded from server. The acquired image is pre-processed so that it can be used for further use. The image is analyzed using K-means clustering and then the features of the selected cluster are extracted. Using SVM the disease is detected, if present and the pesticide required for it is sent as information to the farmer by updating it in the database. The information is later retreived by the farmer by using the ID that was generated before. As a part of Future Enhancement, in order to improve disease identification rate at various stages, the training samples can be increased with the optimal features given as input condition for disease identification and fertilization management of the crops. The complete process described in this project can be automated so that the result can be delivered in a very short time. An application of detecting the plant diseases and providing the necessary suggestions for the disease has been implemented. Hence the proposed objective was implemented on three different types of crops namely Rice, Sugarcane and Cotton. The diseases specific to these plants were considered for testing of the algorithm. The experimental results indicate the proposed approach can recognize the diseases with a little computational effort. By this method, the plant diseases can be identified at the initial stage itself and the pest control tools can be used to solve pest problems while minimizing risks to people and the environment. In order to improve disease identification rate at various stages, the training samples can be increased with the optimal features given as input condition for disease identification and fertilization management of the crops. As a part of Future Enhancement the complete process described in this project can be automated so that the result can be delivered in a very short time. 1. Romana Tazeen, Shilpa H N, Usha P, Mrs. Jayanthi M G, Dr. Shashikumar D R, "Image Processing System for Fertilization Management of Crops", communicated to ICCIT- 2016 to be held on May 20th and 21st at Cambridge Institute Of Technology. 2. 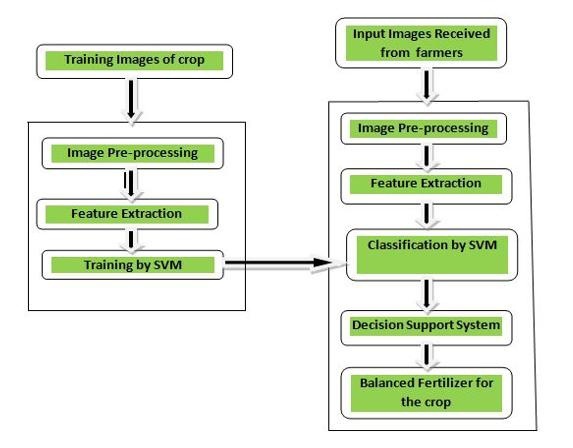 Romana Tazeen, Shilpa H N, Usha P, Mrs. Jayanthi M G, Dr. Shashikumar D R, "Image Processing System for Fertilization Management of Crops", communicated to International Journal of Engineering Research(IJER) - 2016 for publication.